Available for download, AmpliTube Fender from IK Multimedia provides amplifier and cabinet emulations modeled on classic Fender units. Also included are models of vintage stompboxes, rack effects, and miking combinations. In stand-alone mode, this software can also function as a 4-channel recorder for your ideas. Used in any DAW such as Pro Tools or Logic, the software allows you to process DI'd guitar and bass through simulations of various pieces of guitar-related gear, and thus approximate a more realistic Fender tone. Essentially, AmbliTube Fender provides you with an emulated pedalboard, a modeled amplifier, a cabinet stage, and an effects rack, all of which are yours to tweak however you see fit. Not only that—you get two sets of the aforementioned items, and you're able to route your signal through each model in any manner you choose; mono chains, stereo setups, and dual-stages of amplification are possible, as are creative combinations in practically any assortment you could cobble together. 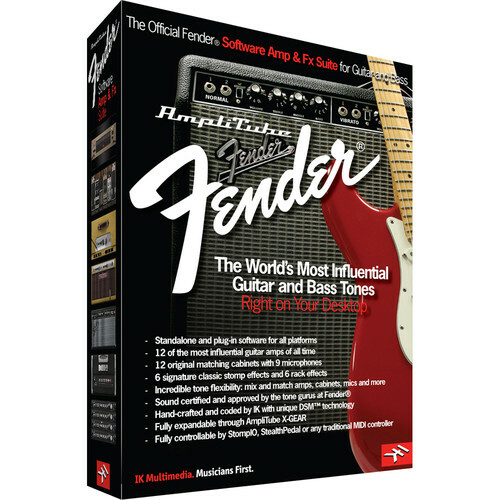 It is also worth noting that the tools in AmpliTube Fender work well in conjunction with analog synths, electric pianos, drums, and even soft-synths. This software is compatible with Mac and Windows platforms, and will work in VST2, VST3, AU, and AAX formats running at 64-bit.